Iranian President Hassan Rohani said Iran will always seek "good neighborly relations," and he called for greater unity between Shi'a and Sunnis, saying they had "coexisted side by side peacefully for hundreds of years." Iranian President Hassan Rohani has sought to mend ties with his Gulf Arab neighbors on a one-day trip to Oman and Kuwait, his first since taking power in 2013. Relations between predominantly Shi'ite Iran and the mainly Sunni Arab countries of the Persian Gulf, particularly Saudi Arabia, remain strained over their support for opposing sides in the conflicts in Syria and Yemen. Rohani said on February 15 that Iran will always seek "good neighborly relations," and he called for greater unity between Shi'a and Sunnis, saying they had "coexisted side by side peacefully for hundreds of years." 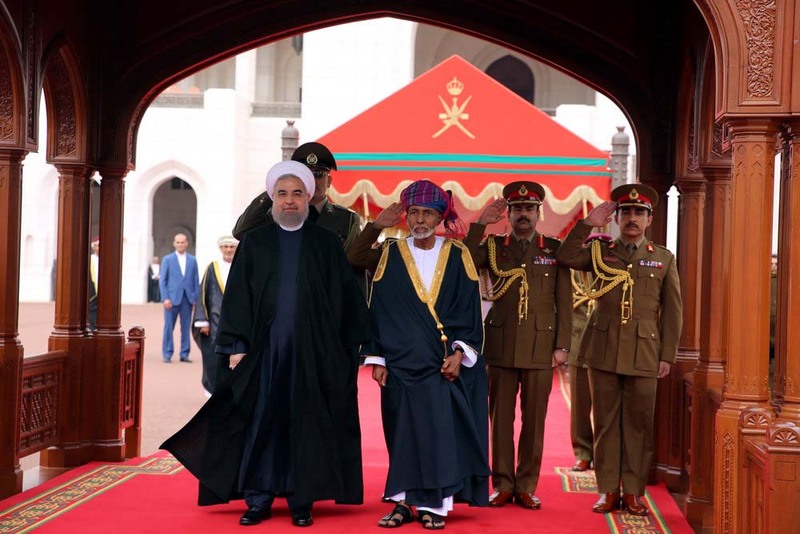 Oman's ruler, Sultan Qaboos, held discussions with Rohani about bilateral cooperation in the capital, Muscat. "Tehran has always been in favor of resolving problems and disputes through dialogue," Rohani said afterward, according to Iranian media. "Iran's military power is only defensive." He appealed for a cease-fire, increased humanitarian aid. and political dialogue to resolve the conflict in Yemen. "Today, the Yemenis are in a particularly disastrous situation and we all have to act as Muslim countries to help this people," he said. Years of war have left Yemen in a state of near famine, according to United Nations officials. Iran has been backing Huthi rebels fighting Yemen's government, which is backed by a Saudi-led Arab coalition that has waged a war of devastating air strikes against the rebels. Iran traditionally maintains good relations with Oman, with which it shares control of the strategically important Strait of Hormuz. Qaboos was the first Arab head of state to visit Iran after Rohani took office and Oman helped to mediate secret U.S.-Iran talks in 2013 that led to the historic nuclear deal last year. In 2013, the two countries signed a $60 billion deal to supply Iranian gas to Oman through a pipeline under the gulf. Later on February 15, Rohani held talks on cooperation with Kuwait's emir, Sheikh Sabah al-Ahmad al-Sabah. Kuwait, where 30 percent of citizens are Shi'a, has maintained normal relations with Tehran despite taking part in the Saudi-led military campaign against Yemen's Shi'ite Huthi rebels. The Gulf Cooperation Council, which includes only Arab states, in December asked Kuwait to initiate contacts with Tehran to start a dialogue to improve ties. 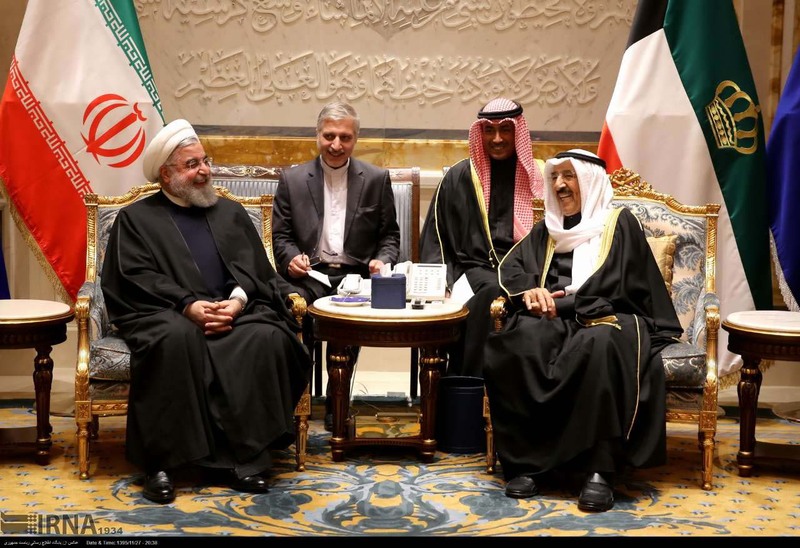 That led to Kuwaiti Foreign Minister Sheikh Sabah Khaled al-Sabah visiting Tehran last month and calling for for a "normalization of ties and opening dialogue." His deputy, Khaled al-Jarallah, said in remarks published on February 15 in Kuwait's Al-Qabas newspaper that he hoped Rohani's visit will lead to a dialogue between the Gulf Arab states and Iran. Jarallah said the elements of dialogue would include Iran refraining from interference in the internal affairs of other gulf states, respecting their sovereignty, and establishing good neighborly relations. While seeking to repair ties with its closest neighbors, Iran has had no diplomatic relations with Saudi Arabia, its archrival,since January 2016, when Iranian demonstrators stormed the kingdom's missions in Tehran and Mashhad to protest the execution of a Saudi Shi'ite Muslim cleric.